The cacao plant originates from the fertile forests surrounding the Amazon River in South America, where it can still be found growing wild today. The small densely branched trees form the understory of the rainforest, thriving in the humid shady environment and nutrient rich soil surrounding the river. The seeds of the cacao tree are dispersed by monkeys and other animals, which break open the cacao pods to eat the sweet pulp and beans encased inside. Newly germinated cacao plants must grow for around 6 years before they are capable of producing seeds, but can continue to survive for up to 100 years. Small white flowers appear throughout the year along the stem of the tree, and must be pollinated within 24 hours of opening by a specific type of tropical midge or they will die. After pollination it takes around 6 months for the fruit to ripen completely, forming the cacao pod from which all cocoa products originate. These pods can be up to 40cm long and are shaped like a rugby ball with thick ridges running laterally and a leathery skin which ranges from yellow through red, orange and even purple in colour. 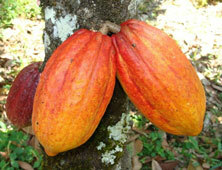 Cacao can only grow in a small belt between 20° north and south of the equator, known as the ‘cocoa belt’. It requires a constant climate, with temperatures between 21 and 32 degrees C and at least 10cm of rainfall each month. Cacao was first harvested for the beans that produce chocolate over 3000 years ago by the ancient South American civilization the Olmecs, who began cultivating cacao trees in Mexico as early as 1000 BC. 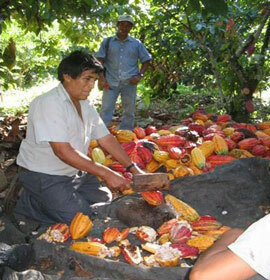 In later years cacao remained a valued crop by successive civilizations across Southern and Central America including the Mayans, Aztecs and the Incas, who developed more advanced methods of growing cacao and processing the beans to make edible products. Cacao was used as a bitter spice, a base for pasta and bread and most popularly consumed as a drink made from roasted ground beans mixed with hot water, chillies and cornmeal and stirred to make a thick, frothy, spicy liquid known as xocoatl. It is reported that the Mayan emperor Montezuma would order over 2,000 jugs of this drink for consumption at a single feast, but cocoa was not only prized for its taste — the beans were also traded as a form of currency and used in religious ceremonies, and held great cultural importance to the native peoples of South America. 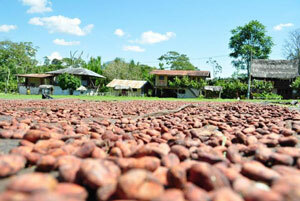 Our cocoa beans are sourced from plantations across Peru, right in the heart of the native homeland of the cacao plant. The cacao trees are grown organically by cooperatives of local farmers using simple traditional farming methods, and our growers are continually encouraged to develop new methods of growing and harvesting their cacao which minimise damage to the environment. Unlike other rainforest crops grown on a large scale such as coffee, cacao cultivation doesn’t drive the clearing of large areas of trees, as the cacao plant needs the shade of the natural rainforest to grow. Our organic cocoa nibs are made with consideration for the environment, and we only source them from suppliers who help promote sustainability and the conservation of the biodiversity in the Amazon jungle. The mature cocoa pods are cut from the trees by hand using a machete, and although the cacao trees produce flowers and fruits throughout the year the main harvest takes place at the end of the rainy season in the late spring. 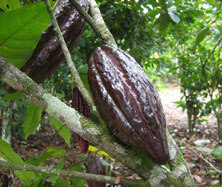 After being harvested the cacao pods are immediately cut open and the seeds and pulp scooped out. The pulp is sweet and mucilaginous, and is left on the seeds while they are fermented. This fermentation process is essential for the cacao beans to begin developing the complex flavours characteristic of chocolate, and takes around a week. The fresh raw cacao beans are placed in large crates and continually rotated using wooden paddles to ensure they are well aerated and don’t become too hot. During fermentation, the sugars in the pulp become slightly acidic and enzymes begin to break down the proteins inside the cacao beans forming smaller amino acid units, which contribute to the cacao flavour. The seeds also change colour from purple to a deep brown. After fermentation has completed the beans are spread out on the ground and allowed to dry under the sun. Drying takes around a further week, and once fully dried the cacao beans can be stored and transported, and the skin acts as a natural protective layer keeping the bean inside safe and clean. The cacao beans are then transported to a collection centre where they are carefully cleaned and sorted to remove any poor quality beans, and passed over magnets to remove even the smallest impurities. They are dehydrated as a heat-free alternative to roasting which doesn’t degrade any of the health promoting antioxidants, and then winnowed to separate the beans from the husks and finally roughly broken into small crunchy cocoa nibs. Cacao was introduced to Europe around 1500 AD, and its popularity quickly spread after the addition of milk and sugar to create the first chocolate bars. The cacao bean is a vital ingredient in chocolate; containing over 1,200 individual chemicals it is responsible for the rich, complex flavours unique to chocolate which cannot be replicated synthetically, but in addition to flavour the raw beans also provide a host of health benefits. 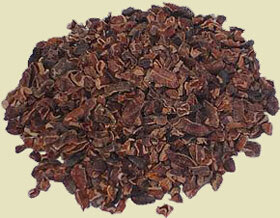 Cacao is very high in flavonoids, a type of antioxidant found in plants. Antioxidants are small molecules which are able neutralise the free radical producing reactive oxygen species that are made as a by product of respiration, making them unreactive and so preventing them from attacking healthy cells. Reactive oxygen species can cause damage to DNA leading to cancer and are also implicated in the ageing process. Cacao contains particularly high levels of the flavonoid epicatechin, which has been proven to reduce high blood pressure by increasing nitrogen oxide production, which helps to relax the blood vessels. Epicatechin can also improve insulin sensitivity and help prevent blood clots and reduce inflammation, which combined reduce the risk of heart disease. The Kuna tribe of Panama subsist almost entirely on cacao drink, and their incidence of cancer, heart disease, diabetes and stroke is only 10%, which is believed to be due to the amount of epicatechin in their diet. Cacao is also rich in theobromine, a compound with similar antioxidant properties to caffeine but without the strong stimulant and diuretic effects that can lead to dehydration. Evidence suggests the flavonols in cacao may also play a role in protecting the skin from UV damage which leads to skin cancer. Many chocolate products found today contain only miniscule amounts of cacao solids (as little as 1%) and the health benefits of the cacao bean are outweighed by the negative side effects of the refined sugar and saturated fat they are packed with. Sugar and fat are used as cheap fillers and substituted for quality cacao ingredients, despite being known to contribute to diabetes and obesity as well as causing the headaches and “sugar crashes” often associated with eating chocolate.